In a recent Fred's Head post, we explored free resources that persons who are blind and visually impaired could access to learn to use Apple products. Along with these resources, however, other materials exist that differ in scope and format and are available for varying levels of costs. 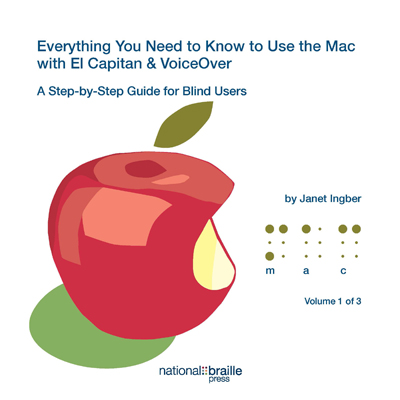 In this post, we will list a number of books, audio tutorials, and multimedia series that persons who are blind and visually impaired or those who teach them may purchase and use to learn or teach persons who are blind and visually impaired to use Apple products. National Braille Press, NBP, offers several books discussing Apple products including iPhones, Macs, the Apple TV, and different categories of apps. This guide on Apple Macintosh computers running the El Capitan Operating System is intended for all blind users - whether you have already been using Windows, currently have a Mac and want to use it more effectively, or are considering purchasing a Mac. 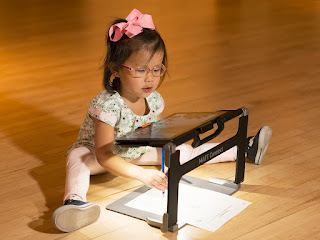 It explains how to use VoiceOver (Apple's onboard screen reader), learn the keyboard layout, choose preferences, navigate text, surf the Web, and use many of the standard applications that come with the Mac, such as Apple Mail, Safari (Apple's web browser), iTunes, and TextEdit. It covers different models of MacBook and iMac. This book is available in multiple formats including Braille, electronic Braille, Word, ASCII, and DAISY. Purchase this comprehensive book about the Mac at this link. This new edition of our soup-to-nuts tutorial for beginners contains everything you need to know to get started using the iPhone and the iOS 9 operating system. If you like step-by-step tutorials, you'll appreciate the detailed way in which you're guided through setting up your phone, loading and backing up music, contacts, etc., placing calls, entering text, using a Bluetooth keyboard and braille display, and more. If you prefer to look up the commands you need, you'll love the first appendix, which lists every gesture and button on the phone in an organized manner so you can find the one you want. Other appendices include troubleshooting tips and a list of resources to help you learn more. Most of the book is relevant for iPod Touch users, and since the layout of many iPhone 6 Plus screens resembles that of corresponding iPad screens, iPad users should find this edition useful as well. The book is available in multiple formats and can be purchased at the following link. The incomparable Jonathan Mosen takes you through the latest enhancements to Apple's iDevices - for the iPhone, iPod Touch, and iPad - with iOS 9, showing it to be a more powerful, more capable, and more open system than ever before. Learn all about its newest feature, 3D Touch, as well as peek and pop, Apple Music (3 months of free access to 30 million songs! ), what's new with Siri (new voices and a flight status detector), built-in Apple News, a re-vamped Notes, Apple Map transit directions, improved battery life options, Find My Friends, iCloud Drive, Home Kit, and so much more! You also may purchase iOS 9 Without the Eye directly from Jonathan Mosen’s website, Mosen Consulting, which offers Jonathan’s blog and features all of his publications and other services which he provides. Buy iOS 9 Without the Eye from NBP at http://www.nbp.org/ic/nbp/IOS9-EYE.html, check out Mosen’s site at http://mosen.org/, and follow Mosen Consulting on Twitter @MosenConsulting. Remember that the iOS 9 books should be updated and/or rereleased when subsequent versions of iOS software become available. Mosen’s book iOS 10 Without the Eye, for instance, can be preordered now on the Mosen Consulting site and can be downloaded on the day that iOS 10 is available for download. The remaining selections offered by National Braille Press are more specific in their scope, consisting of an iOS 9 Reference Guide, a Mac Reference Guide, and several books about specific types of apps. These books about apps include Anyone Can Play: Accessible Games for the iPhone, iPad, and iPod Touch, Out and About: Our Favorite iOS Travel Apps, and Twenty-Two Useful Apps for Blind iPhone Users (Second Edition). NBP’s site includes Tables of Contents for each of these books, all of which can be downloaded at http://www.nbp.org/ic/nbp/publications/apple.html. Although this list states that it covers all the Apple-related books available, further searching of NBP’s site shows two additional Apple-related books in the “Computers and Technology Section”. These include Stream It! Music, Movies, and More with Apple TV and VoiceOver and Get the Picture! Viewing the World with the iPhone Camera. You also may find these books listed in NBP’s Computers and Technology Section of their bookstore. You can follow NBP @braillepress on Twitter, https://www.facebook.com/NationalBraillePress on Facebook, https://www.youtube.com/user/NationalBraillePress?feature=watch on YouTube, https://www.pinterest.com/braillepress/ on Pinterest, and https://nationalbraillepress.wordpress.com/ which is NBP’s blog. 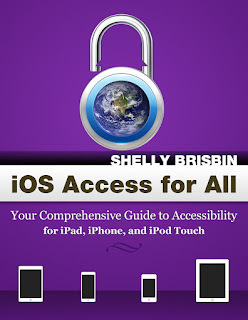 iOS Access for All is a comprehensive guide to the accessibility features of Apple’s mobile devices. From the VoiceOver screen reader, which allows blind users to control an iPhone or iPad, to support for hearing aids and closed captioning, Apple’s mobile operating system, iOS, includes features that support use of the company’s popular iDevices by people with a wide range of physical and cognitive disabilities. 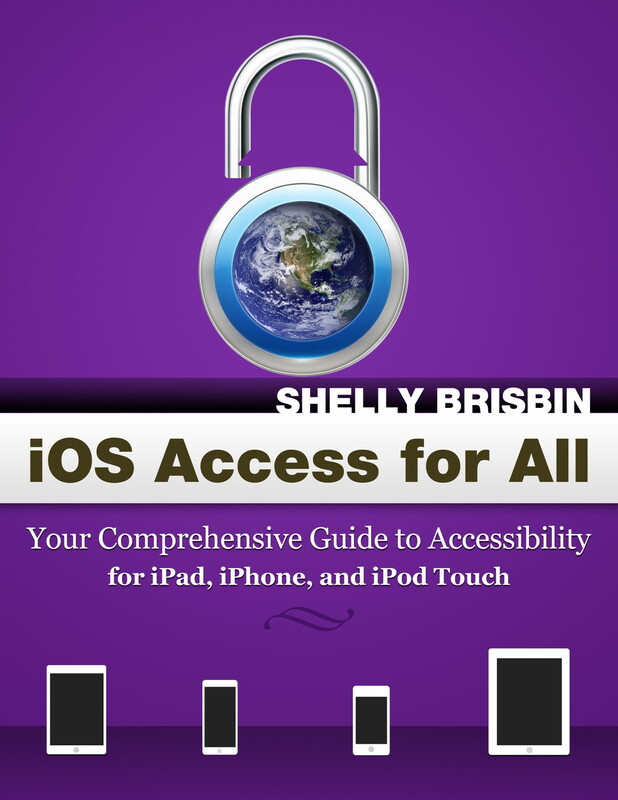 iOS Access for All is the most thorough, hands-on guide to accessibility features available. Readers will learn how to set up and use an iOS device in an accessible way, and how to get the most from apps provided by Apple, and available from the App Store. The book also introduces iOS tools, including the Siri voice assistant, that weren’t designed for accessibility, but that nonetheless enhance the productivity and pleasure of disabled users. Brisbin offers a Table of Contents, a sample chapter available for download, and an explanation as to why she wrote this book on the site that promotes the book. She also has stated that the version for iOS 10 should be available in the fall, assuming that version 10 is released as expected by Apple. If anyone buys the version 9 book after iOS 10 is released and before Brisbin’s newest book is released, they will receive the revised book for version 10 for free. Read the information about this resource at http://www.iosaccessbook.com/. You may receive email updates from this site which also provides social media links. Follow @iosaccessbook on Twitter, https://www.facebook.com/IosAccessForAll on Facebook, and https://plus.google.com/communities/104191387699677276608 on Google Plus. We discussed MacForTheBlind’s available resources in the post about free resources for people who are blind who wish to learn to use Apple products. However, the site also offers audio tutorials for sale. Two pages of audio lessons exist, one for the Mac and one for iOS devices. The advantage of this series is that you do not have to go through every file; you may pick and choose which files most interest you. The Mac page lists 20 files, the first of which is free and contains introductory VoiceOver information. The iOS page contains 14 files, the first of which is introductory in nature and is free. Check out the Mac audio tutorials at http://macfortheblind.com/Audio-Tutorial-series and the iOS tutorials at http://macfortheblind.com/iOS-Lessons. Follow MacForTheBlind @macfortheblind on Twitter and https://www.facebook.com/macfortheblind/ on Facebook. They expect to have a YouTube channel in the future. The nation’s first provider of consulting, teaching and support for Apple’s range of accessible technologies (including the Mac, iPhone and iPad), Fedora Outlier, LLC, partners with private consumers, agencies and government organizations to provide better than excellent products and services to encourage, equip and empower users to do more with their technology. Fedora works with agencies and individuals, offering specialized training; they also provide comprehensive training on Apple products with their Mac Master Series, iOS Master Series, and their Apple Watch Master Series. Each series focuses on that particular Apple product or operating system and offers “Teaching from the time you take your device out of its box to mastery.” Each series offers a standard and premium membership; premium memberships offer one-on-one coaching opportunities in addition to the elements present in the standard editions. Each series requires a yearly membership. When you purchase any yearly membership, you receive weekly class modules (Mac and iOS Master Series) or monthly class modules (Apple Watch Master Series) in audio and/or video formats that teach a particular aspect of the product or operating system, dedicated forums, quick tips, and the opportunity to ask questions of the coaches of each series. Premium memberships offer discounts on other courses or series Fedora offers and opportunities for more one-on-one interaction with coaches and even the possibility to benefit financially for getting people to enroll in a series. Thus, each series walks you step-by-step through the process of mastering each device or operating system from unpacking the box to setting up your device, learning its basic features, and discovering advanced features. Fedora’s site also lists additional courses that will be released soon. You may contact Fedora in several ways for additional information. Contact them by E-mail or iMessage at: Excellence@FedoraOutlier.com, @fedora_outlier on Twitter, https://www.facebook.com/fedoraoutlierllc on Facebook, https://www.linkedin.com/company/fedora-outlier-llc on LinkedIn, and https://plus.google.com/114511140220970872889/posts on Google Plus. As you can see, the existing resources available for purchase for persons who are blind or visually impaired who want to learn to use Apple products are quite varied and extremely comprehensive in scope. As Apple changes its products and operating systems, these resources should be updated to reflect the changes.